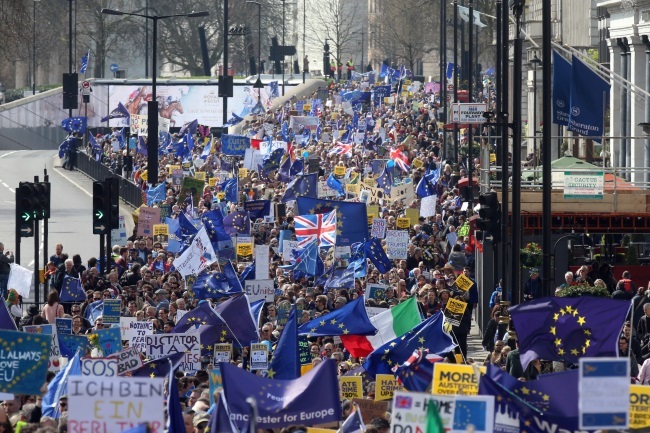 The Police estimated that 100K people attended the “Unite for the EU” march on Saturday; we used to double the police numbers in order to gauge the true size of the demo. Actually it’s been hard to discover its size with some sources describing the attendance as in the 1000’s. The TUC’s “March for the Alternative” in 2011 is reported on wikipedia as being between 1/4 & 1/2 million, but 100,000 is big; obviously not as big as the 1m that marched against the Iraq war in 2003 and that changed little. The BBC’s reporting of the march has been complained about; describing 100,000 as thousands would seem to be a deliberate attempt to downplay the demo and its politics, we’ll see what happens there. I am sorry that I couldn’t be there. The image is from the IB Times, the image is linked to their article in which they published the picture. I have made a copy for the purposes of supporting a permalink and performance. I am not ‘making it available’. This site is not for profit.